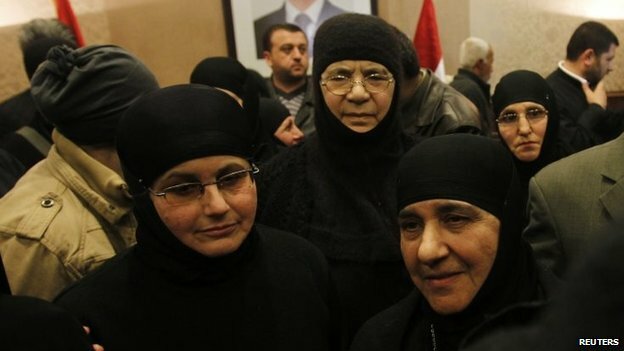 A group of Greek Orthodox nuns held for three months by rebels in Syria after being taken from their convent in Maaloula have arrived back in Damascus. The nuns were brought to the Lebanese border town of Arsal early on Monday where they were handed over to Lebanese officials and then driven to Syria. They said they were tired, but that they had been mostly well treated. 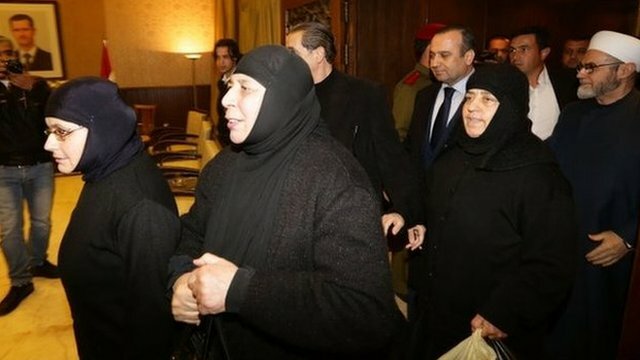 They were freed as part of a prisoner exchange involving some 150 women and children held by the Syrian government. The deal was negotiated by officials from Qatar and Lebanon. The release of the nuns took several hours more than expected, and at one point the deal appeared on the verge of collapse. 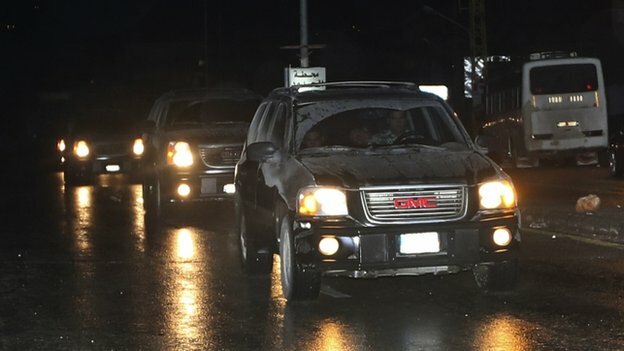 General Abbas Ibrahim, the director of Lebanon's General Security agency who played a key role in mediating the deal, said the kidnappers tried to secure better terms at the last minute. He said he ordered the officers in charge of receiving the nuns to walk away when the captors demanded more prisoners than the agreed 150 be set free. "I knew they'd call back," he told journalists gathered in Jdeidet Yaboos. The nuns and their attendants, exhausted but apparently well after their ordeal, were brought through a rebel border crossing to Arsal, a town the north-eastern Bekaa Valley, early on Monday. They were then quickly taken to the nearby official border point and handed over to the Syrian authorities. Damascus Governor Hafez Makhlouf was among the officials who greeted the nuns before they were driven to the Greek Orthodox patriarchate. It is believed they were held by the al-Nusra Front, a jihadist rebel group affiliated to al-Qaeda. Mother Pelagia Sayyaf, head of the Mar Takla monastery in Maaloula, said the nuns had been treated well. 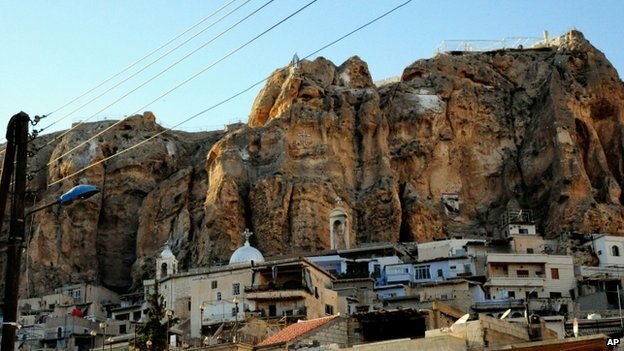 After their capture in Maaloula in December, they were reported to have been moved to Yabroud, a rebel-held town near Lebanon's border that is currently the focus of a major campaign by the Syrian army and fighters from the Lebanese Shia Islamist movement, Hezbollah. "What the Syrian army achieved in Yabroud facilitated this process," said Bishop Louka al-Khoury of the Greek Orthodox patriarchate. George Haswani, a pro-government Christian businessman from Yabroud, told the Lebanese television channel al-Jadeed that the nuns had stayed at his villa and that President Bashar al-Assad had on several occasions personally checked on their health. The rebels had said that they were protecting the women from government shelling, while Syrian officials had said they were abducted to intimidate the country's minority Christian community. The BBC's Jim Muir in Beirut says that months of delicate negotiations - involving mediation by Qatar, which is deeply involved with the Syrian rebels, and Lebanese security officials - finally produced agreement on a prisoner exchange under which around 150 Syrian women detained by the government are also to be freed. Two rebel leaders from Yabroud claimed Qatar had offered to pay $4m (£2.4m) for the nuns' release, but that the al-Nusra Front had demanded $50m (£30m) and the release of detained women and children. Syrian state media reports did not mention any swap or payment. Our correspondent says the same negotiating mechanism was used last year to free a group of Lebanese Shia captured by Syrian rebels, in exchange for two Turkish pilots abducted in Lebanon. The nuns' plight highlighted the delicate position of Syria's Christians. When the uprising against President Bashar al-Assad erupted in March 2011, many Christians were cautious and tried to avoid taking sides. However, as the crackdown by security forces intensified and opposition supporters took up arms, they were gradually drawn into the conflict. Many fear that if the secular government is overthrown, they will be targeted by jihadist rebels calling for an Islamic state and that Christian communities will be destroyed, as they have been in Iraq since 2003.